In 1958 in a school in Rhandirmwyn, a child approached their teacher and told them of the strange, new sight they had seen in the woods; a grey squirrel had been spotted for one of the first times in Wales. So much has changed in the last sixty years, and it is now only sightings of red squirrels that are tale-worthy. Slight, with richly russet-red fur and large, tufty ears, our only native squirrel (Sciurus vulgaris) hasn’t given up the ghost yet though, and graces the treetops in small pockets of populations scattered throughout the British Isles. Once, red squirrels were widespread throughout the UK. Sadly, the translocation of North American grey squirrels (Sciurus carolinesis), introduced as an ornamental species in the 1870’s, had tragic consequences for our fiery-haired friends and they have been in rapid decline ever since, becoming one of Britain’s most endangered mammals. Grey squirrels carry parapox virus, which does not affect their own health, but is fatal to red squirrels. They also outcompete reds in broadleaf forest, more easily digesting high-tannin content nuts and seeds, like acorns. To add insult to injury, greys raid red squirrel food hoards. Red squirrels don’t hibernate and although they eat many food types including buds, shoots, fungi, insects, beetles and birds’ eggs, their food caches are vital to their overwintering. Greys are also more willing to cross open spaces, thus more readily exploiting food sources and habitat. In such pressured environments reproduction in red squirrels suffers, but when the going is good, they are prolific breeders, and can have two six-strong litters a year. Red squirrels could recover quickly, if they had the chance. There are only an estimated 140,000 red squirrels left in the UK, largely overshadowed by the 2.5 million grey squirrels. Habitat loss and fragmentation since the 1800’s has exacerbated their plight, and creation and protection of woodland is essential to prevent them disappearing altogether from the British landscape. Mixed broadleaf woodland with some conifer and plenty of small seeded deciduous trees such as alder, aspen, willow and birch is an ideal habitat for reds. 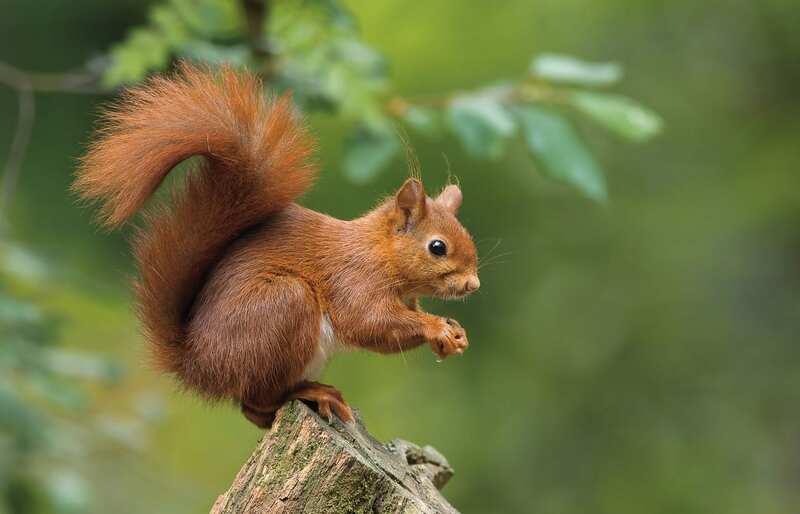 The British Isles have fragmented red squirrel strongholds in parts of Scotland, Wales, Northern Ireland, the Lake District and some islands. Measures are being taken in these areas to help conserve them, but it is a constant battle against the tide of grey squirrels that dominate so much of British woodland. However, red squirrel projects in the UK have enjoyed great success, notably a project in Anglesey that boosted a red squirrel population of just 40 to 700 in under 20 years, by clearing grey squirrels and allowing reds to naturally re-establish themselves. Some of the Anglesey squirrels have migrated across the Menai Bridge to Ogwen Valley near Bangor, a valley naturally fortified against grey squirrels, protected by the flinty spine of mountains that encircle it. Conservationists are giving these little pioneers a chance by boosting their numbers with translocated red squirrels from Norfolk, which will also broaden the genetic diversity of the population. A similar project, The Mid Wales Red Squirrel Partnership (MWRSP), hopes to strengthen the pockets of red squirrel populations in mid-Wales, and the newly established pine marten population in mid-Wales (translocated by The Vincent Wildlife Trust), may in time help naturally control the grey squirrel population, as the slower, larger greys are easier catch than their lithe and nimble cousins. Red squirrels are solitary and elusive, spending around 80% of their time high in the tree canopy, red amongst the rustling green, building intricate nests, or dreys from twigs, moss, fungi and hair. Ingeniously, some even build ‘decoy’ dreys to confuse predators. The busy red squirrel, bustling about the treetops, is often depicted as a gossiping messenger in both Native American and Norse mythology. The red squirrel Ratatoskr in Norse mythology clambers up and down Yggdrasil, the world tree, passing messages between the wise eagle in the topper-most branches and the cunning dragon coiled around its roots. Tales abound of how Ratatoskr would embellish the messages, stirring up animosity between the two creatures. Some Native American stories see these messengers differently, as watchful forest guardians that bring warnings of danger, to be admired for their courage and prolific food gathering. Our hardy remaining British populations show that red squirrels can readily naturally recover, in spaces away from greys, in the haven of the wildwood, where they can leap, gossip, nibble and frisk safely in the high, tangled branches of the trees.